His Holiness Patriarch Alexei II (Ridiger) of Moscow February 23, 1929 - December 5, 2008) was the Patriarch of Moscow and the head of the Russian Orthodox Church from 1990 until his death. He entered Leningrad Theological Seminary in 1947, and graduated in 1949. He then entered the Leningrad Theological Academy (now Saint Petersburg Theological Seminary), and graduated in 1953. On April 15, 1950, he was ordained a deacon by Metropolitan Gregory (Chukov) of Leningrad, and on April 17, 1950, he was ordained a priest and appointed rector of the Theophany church in city of Johvi, Estonia, in the Tallinn Diocese. On July 15, 1957, Fr. Alexei was appointed Rector of the Cathedral of the Dormition in Tallinn and Dean of the Tartu district. He was elevated to the rank of Archpriest on August 17, 1958, and on March 30, 1959, he was appointed Dean of the united Tartu-Viljandi deanery of the Tallinn diocese. On March 3, 1961, he was tonsured a monk in the Trinity Cathedral of Holy Trinity-St. Sergius Lavra. On August 14, 1961, he was chosen to be the Bishop of Tallinn and Estonia. On June 23, 1964, he was promoted to archbishop; and, on February 25, 1968, at the age of 39, to metropolitan. From 1986 until his election as Patriarch, he was Metropolitan of Novgorod and Leningrad. 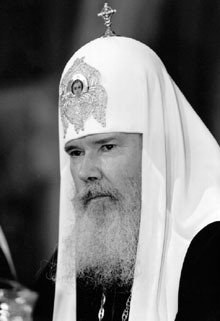 After the death of Patriarch Pimen in 1990, Alexei was chosen to become the new Patriarch of the Russian Orthodox Church. He was chosen on the basis of his administrative experience, and was considered "intelligent, energetic, hardworking, systematic, perceptive, and businesslike." He also "had a reputation as a conciliator, 'a person who could find common ground with various groups in the episcopate.' " Archbishishop Chrysostom (Martyshkin) remarked, "With his peaceful and tolerant disposition Patriarch Aleksi will be able to unite us all." Patriarch Alexei II was "the first patriarch in Soviet history to be chosen without government pressure; candidates were nominated from the floor, and the election was conducted by secret ballot." Upon taking on the role of Patriarch, Patriarch Alexei became a vocal advocate of the rights of the church, calling for the Soviet government to allow religious education in the state schools and for a "freedom of conscience" law. During the attempted coup in August 1991, he denounced the arrest of Mikhail Gorbachev, and anathematized the plotters. He publicly questioned the junta's legitimacy, called for restraint by the military, and demanded that Gorbachev be allowed to address the people. He issued a second appeal against violence and fratricide, which was amplified over loudspeakers to the troops outside the Russian "White House" half an hour before they attacked. Ultimately, the coup failed, which eventually resulted in the break-up of the Soviet Union. Under his leadership, the New Martyrs and Confessors of Russia who suffered under Communism were glorified, beginning with the Grand Duchess Elizabeth, Metropolitan Vladimir of Kiev, and Metropolitan Benjamin of Petrograd in 1992. In 2000, the All-Russian Council glorified Tsar Nicholas II and his family, as well as many other New Martyrs. More names continue to be added to list of New Martyrs, after the Synodal Canonization Commission completes its investigation of each case. Despite his age during his patriarchate, Patriarch Alexei II led an active political life. He was frequently seen on Russian television, conducting church services, and meeting with various government officials. He died on December 5, 2008. His name (secular 'Алексей, clerical Алексий) is transliterated from the Cyrillic alphabet into English in various forms, including Alexius, Aleksi, Alexis, Alexei, Alexey, and Alexy. When he became a monk, his name was not changed; this departure from custom was common in the Russian Church in Soviet times. Since the collapse of the Soviet Union there have been accusations that Patriarch Alexei had ties to the KGB, which resulted from documents which allegedly came from the KGB's archives in Estonia, and which refer to Patriarch Alexei with the code name "Drozdov." It should be noted that it was very unusual for any person to be referenced in KGB documents prior to 1980 without a similar code name, regardless of an affiliation with the KGB. Patriarch Alexei has always denied that he was a KGB agent, and the authenticity of the documents in question have been disputed on the basis that they use anachronistic fonts which did not exist at the time the document ostensibly originated from, and that the Estonian government fabricated the documents in order to discredit the Russian Orthodox Church. Professor Nathaniel Davis pointed out: "If the bishops wished to defend their people and survive in office, they had to collaborate to some degree with the KGB, with the commissioners of the Council for Religious Affairs, and with other party and governmental authorities." Patriarch Alexei has, however, acknowledged that compromises were made with the Soviet government by bishops of the Moscow Patriarchate, and publicly repented of these compromises. "Defending one thing, it was necessary to give somewhere else. Were there any other organizations, or any other people among those who had to carry responsibility not only for themselves but for thousands of other fates, who in those years in the Soviet Union were not compelled to act likewise? Before those people, however, to whom the compromises, silence, forced passivity or expressions of loyalty permitted by the leaders of the church in those years caused pain, before these people, and not only before God, I ask forgiveness, understanding and prayers." According to Nathaniel Davis, when asked by the Russian press about claims that he was a "compliant" bishop, "Aleksi defended his record, noting that while he was bishop of Tallinn in 1961, he resisted the communist authorities' efforts to make the Alexander Nevsky Cathedral in the city a planetarium (which, in truth, they did do elsewhere in the Baltic states) and to convert the Pyukhtitsa Dormition nunnery to a rest home for miners." Official records show that the Tallinn diocese had a lower number of forced church closings than was typical in the rest of the USSR during Patriarch Alexei's tenure as bishop there. Metropolitan Kallistos (Timothy Ware) notes, "Opinions differ over the past collaboration or otherwise between the Communist authorities, but on the whole he is thought to have shown firmness and independence in his dealings as a diocesan bishop with the Soviet State." ↑ 1.0 1.1 Alexy II, Patriarch of Moscow and All Russia, Biographical Note, Biography, on the Moscow Patriarchate's official website. ↑ 4.0 4.1 Nathaniel Davis, A Long Walk to Church: A Contemporary History of Russian Orthodoxy, 2nd ed. (Oxford: Westview Press, 2003), p. 86. ↑ 8.0 8.1 Timothy Ware, The Orthodox Church, new ed., (London: Penguin Books, 1997), p. 164. ↑ Sophia Kishkovsky, Russian Orthodox Church is set to mend a bitter schism, International Herald Tribune, May 16, 2007; Second day of bishops' council: Nicholas' canonization approved, Communications Service, Department of External Church Relations, Moscow Patriarchate, 14 August 2000. ↑ See for example, The Wall Street Journal, 'Cold War Lingers At Russian Church In New Jersey' December 28, 2007. ↑ Alexey Chumakov Agent Drozdov?, December 28, 2007. ↑ Has the MP Repented?, December 28, 2007. ↑ From an interview of Patriarch Alexei II, given to "Izvestia" No 137, June 10, 1991, entitled "Patriarch Alexei II:—I Take upon Myself Responsibility for All that Happened", English translation from Nathaniel Davis, A Long Walk to Church: A Contemporary History of Russian Orthodoxy, (Oxford: Westview Press, 1995), p. 89. See also History of the Russian Orthodox Church Abroad, by St. John (Maximovitch) of Shanghai and San Francisco, December 31, 2007. ↑ Nathaniel Davis, A Long Walk to Church: A Contemporary History of Russian Orthodoxy, (Oxford: Westview Press, 1995), fn. 115, p. 272. This page was last edited on November 28, 2018, at 14:16. This page has been accessed 98,031 times.